Alhamdolillah now you are able to get Free Qurans in GA. We have been able to install about over a dozen Quran Stands in various Muslim Businesses and Mosques. We have been blessed with hard working volunteers, who are in charge of restocking the Qurans and maintaining the stands. We provide Qurans in English and Spanish along with brochures providing information on various subjects. American Islamic Outreach Foundation gives out Free Qurans to whomever is willing to learn. 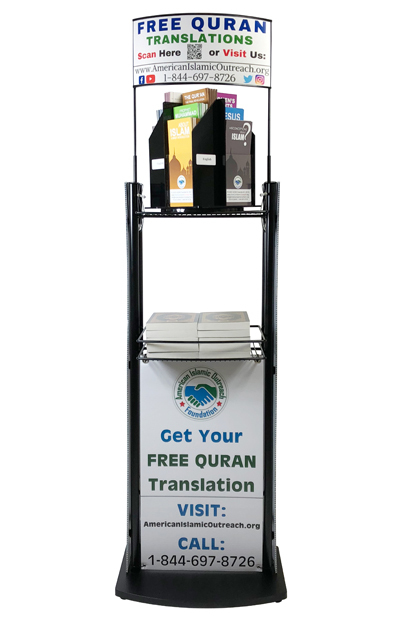 Our Quran Stands are a one place literature stand that provides Free Qurans in English and Spanish, along with Brochures providing information on various subjects. This project has benefited American Islamic Outreach Foundation by being able to reach the public in and around the Carolina’s. We have been able to help and educate members of all faiths. Dawah is greatly needed in these times. We are here to help educate and to dispel any misconceptions about Islam.